These days, consumers are spoiled with choices. It doesn’t matter which appliance we are talking about. The cut-throat competition between the different brands and different products is responsible for this. Therefore, we now have 0.5 ton air conditioners to 5 ton air conditioners. This article will focus on something in between. The 1.5 ton air conditioner. When you look to buy an air conditioner there are some standard perimeters to look at. The tonnage is one aspect, the capacity aspect, while here a couple of other aspects to look at. Electricity consumption: Air conditioner’s are household appliances that consume a lot of electricity. In fact, one of the sole reasons the middle class family avoids this purchase is because of this aspect. One fears that with the purchase, one is incurring a never ending expenditure in the form of a larger electricity bill. These days air conditioners are differentiated from each other on the basis of their energy consumption as well, this can be judged by looking at their energy rating. Features: When you buy any appliance that is looked at as a luxury purchase, its features matter. Therefore, it is never wise to ignore the features. They add to your comfort, make things easier and could entail some benefits that you hadn’t thought of. We have also picked our own choices to give you more idea and information about top 1.5 ton air conditioners in India.Check the below list and choose one that can best serve you. Loaded with features and a 3-star energy saving rating, it’s quite an attractive model. Anti-bacteria and Active Carbon filters ensure that the air it releases is not only pollutant free, but odourless as well. A unique feature of this model is the 4 Way Air Deflection technology that it uses. This really allows the equitable distribution of air along the room where it is installed. Apart from these features, it has the more common ones such as: Sleep mode, Auto-Restart, Auto-swing and so on. Part of Voltas split series AC, this particular model has a 5-star energy rating. Not one, not two, but the air goes through five filters to ultimately result in the clean and pure air it releases. It comes equipped with a Self Diagnosed system that alerts the user on when they need the help of a professional, to fix its bearings. Just like most of the air conditioners in this class, the other functions it comes with include a Sleeper mode, Timer, Lock, Turbo, Swing, etc. Built to be made ideal for every weather condition, it comes with a number of features that assist it to become just that. The Dry mode is ideal for humid and rainy conditions. While, the Sleep mode is ideal for, obviously, sleep. The wide-angle and swing mode will make sure that every nook and corner of your room can benefit from the cool air. Its Auto-restart mode has a tweak. Not only does it switch the air conditioner on, automatically, but it also switches it ensure that the temperature settings aren’t muddled with and they are exactly as they were before the power cut. 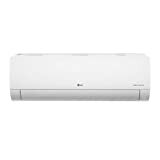 This model by LG is energy efficient and loaded with a lot of features as well, to make it an ideal air conditioner in many ways. It has 5-star energy rating. The Himalaya Cool technology is responsible for the disbursement of cool air. While, the monsoon comfort technology provides the perfect cooling effect on rainy/humid days. The anti-rust exterior ensures durability. Some of its other functions include: Timer, Sleep mode, Auto-clean feature, Air-filtration technology etc.